Posted on 31-10-2014 by Peter W. Szabo & filed under UX Management. I will demonstrate to you how a methodology developed by a Japanese car manufacturer in the ‘50s can tremendously improve the workflow of the team you are managing, especially a creative team. After implementing Kanban at WhatUsersDo, we now have a streamlined workflow, which now can be overviewed and managed easily. We can see bottlenecks and pain-points at a glance, but most importantly everything works smoothly and in a transparent manner, reducing frustration and stress for the team members. As Head of User Experience at WhatUsersDo Ltd. one of my main challenges is to optimise the processes of creating user testing proposals, test strategies and designs. WhatUsersDo Ltd. started as a SaaS for remote user experience testing. Currently it’s more than just that: Headquartered in London, WhatUsersDo supports industry giants to further develop their User Experience; we do this by providing them natural, in-the-moment insights, coming directly from users. Among these companies you find AXA, Virgin Atlantic, Marks & Spencer, O2, Ryanair and Cisco. We assist these companies with proactive account management and a UX team that helps interpret the test results. We can count on a very large international, UK and US tester panel. I’m obviously biased, but I firmly believe that WhatUsersDo is the best enterprise solution for remote UX testing. This year we experienced an exponential growth, so we needed a new methodology for workflow management. When I joined WhatUsersDo, we only had a Google Spreadsheet called “Client_Priorities”. From there to just-in-time delivery it’s a huge leap, but a very worthwhile one: Kanban helped in this optimisation tremendously. Walking you through our process I’ll use the “Test Design Process” board from WhatUsersDo as an example, but of course you can also have multiple boards, as we do. First of all, it’s a Japanese word for “sign board”, and in its root, it’s just that. A huge board with a lot of sticky notes attached to it. The board itself is the most important asset, and works as a scheduling system for lean JIT production. Kanban is a visual model of your work and workflow. The board is divided into columns, each being a step in the production chain. 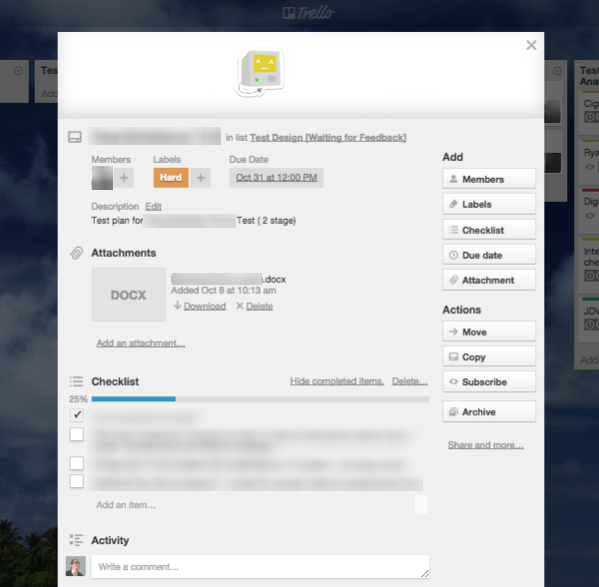 Cards represent tasks or subtasks, and in larger project boards can be kept simple by linking them. 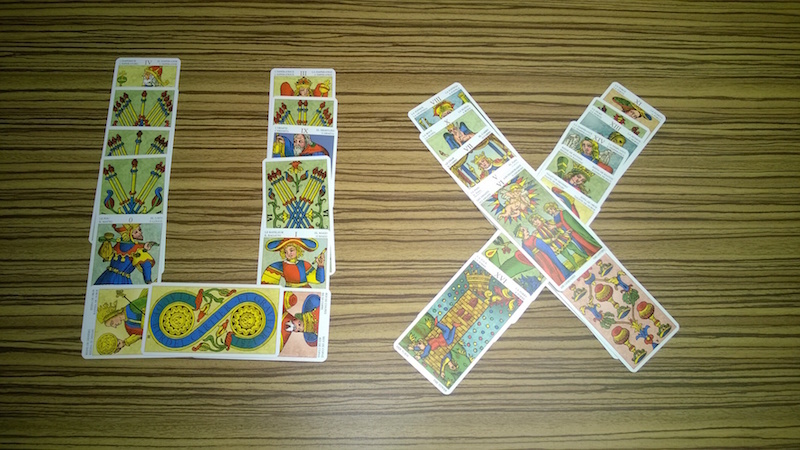 The cards can be color-coded to fit the project’s needs and they can be assigned a “card owner”. In WUDs case card owners are almost always the senior account managers; they look after a certain set of cards through their lifecycle until it’s time to archive them. You will probably assign deadlines for certain cards (something like card X should reach column Y by date Z) at the beginning. But as Kanban starts to become part of the corporate culture you will discover you very rarely need deadlines on cards. Work gets done in time because it’s apparent what needs to be done. The very first problem WhatUsersDo had is what the industry often calls demand forecast. Similarly to its stepbrother the weather forecast, demand forecast is highly unreliable. But if you can’t really foresee the demand, how can you plan anything? How you don’t succumb into the chaos? If you follow a push based management methodology, it will be a huge issue for the team’s mood and for the quality of production. You can instead turn things upside down and apply a pull based methodology like Kanban. The issue will disappear, as the production chain will immediately respond to an observed demand. For example, let’s say that tomorrow BMW AG asks for 200 remote tests, based on 5 different test designs: 5 new cards are created in the “Brief [Started]” column. Then someone from the UX team can plan the creation of test designs and pull the finished Briefs from the “Brief [Done]” column into “Test Design [Started]”. In the same way account managers will pull cards from “Test Design [Signed off]” into the “Test Launched”. Each column is basically a key phase in the production chain and everything is clearly visible at a glance for all the team members. This ensures that it will not happen again that too many test designs are created at once or, more importantly, too many tests are launched at the same time. The workload is always balanced, and everyone always has work at their hands and can work at their peek potential: team members feel satisfied and in control. It is hard to imagine how a few columns on a board can lead to increased communication and productivity, but this is what happens when you make highly visible the work done by each employee . This is more than communicating negativity, bottlenecks, unavailable employees, missed deadlines or angry clients. Kanban lets you communicate positive things, like quick wins and achievements. Moving a card through the whole process to the very last column is a small but visible achievement for the whole team; a card moved to the “Done” column of a single step will be empowering for the single employee. I believe this is one of the easiest collaboration tools available. Kanban reduces the need for reprioritizing and eliminates the confusion caused by task switching, that often plagues small creative agencies. Also, analysing the board, even just observing it for a small amount of time, you will see lots of possibilities for workflow improvement. It helps to plan recruitment, as well, and eventually decreases the time spent on directly managing people. Once you implemented Kanban, it will quickly become the cornerstone for Kaizen: continuous improvement of the organization. Teams and team members alike will measure their effectiveness by tracking flow, quality and throughput. Long story short: everyone wins by simply moving cards around a board from one column to another. In the digital age cardboard cards and wall-mounted kanban boards are replaced by myriads of digital tools. The sense of accomplishment is a bit lost, since you don’t get to proudly march to the wall and move a card with a strong and purposeful motion, but eKanban enables teams to work with this methodology even overseas if necessary. There are no lost cards, and analysing the card movement is possible even without constantly keeping watch of the board or strategically positioning it next to your desk. When charged with the responsibility of choosing an eKanban app I reviewed quite a few of them, but I won’t weigh you with a comparison now. The very basic things you need are: multi-user management and ability to assign users to color-coded cards. Having checklists and file attachments on cards is a nice bonus, and often useful. I think Trello has all the features I like in an eKanban, while being very simple to use and learn. Its great visual design is also a big plus, but also the fact that, from a purely functional perspective, anything works. Even if everyone in your organization works in the same floor I would prefer eKanban to a wall-mounted monstrosity: post-its are not responsive and if pristine white office walls intimidate the team, you can add cat pictures to taste. “It takes 6 months to build a Rolls-Royce and 13 hours to build a Toyota.” This might sound a bit unfavourable for Toyota, but truth to be told Rolls-Royce Motor Cars has less than 1.5k employees, Toyota over 300k. In 2013 Toyota sold 9.98 million cars, while Rolls-Royce sold 3 630 cars. Toyota is the world’s top-selling automaker, but if a genie would gift you a car, most likely you would pick the Rolls. The morale of the story is that your clients would want to be treated like Rolls-Royce customers, but they want to pay the price of a (used) Toyota. So make sure they don’t feel like being served a “fresh from assembly line in 13 hrs” kind of creative service. The art of management is to mask the streamlined production with genuine interest in the client’s needs and to deliver them the Rolls-Royce they are expecting in very little time. This is where Kanban excels. Kanban was developed half a century ago, why should we not turn to more recent methods? Well, there are a few alternatives (CONWIP is the most popular among them), but my experience is Kanban stood the test of time. It evolved gracefully in the digital age, benefiting from digital boards, and its strengths still deliver value to lots of organizations: from the automotive industry to remote UX testing. All in all, if you are looking for a way to greatly enhance the workflow of your company, by all means consider Kanban. Hi Peter – good post. I believe the number of teams using kanban for knowledge work is growing by the day. Which is great. Me and my team are just at the beginning of making a jump to running the creative part of our work via an agile method – it’s exciting! I also read this article on how kanban is the right choice for UX design (which is what we do). Highly recommend it. Thanks a lot for the comment. I checked out your article, it’s great. Thanks a lot. I love your methodologies. this site is an amazing resource. I am so grateful that you put this out here for people to see. I use these practices at work and with my teams.